Frequent readers of this blog know that I’m obsessed with Open Badge eCredentials. I think they provide a fantastic lens to analyze and improve the quality of lifelong, lifewide learning: for delivery, for recognition or “valorization” and for use as a skills currency. But I now have a new lens: Extended Enterprise Learning (also called Extended Enterprise Training or EET). I think it’s a great way to engage pragmatic private sector companies about the benefits of Open Badge eCredentials. IBM is just one example of early adopting companies who are beginning to see the benefits. For me, Extended Enterprise Learning is a threshold concept: it opens up new vistas and reframes previous insights. I’m currently refactoring my thinking with this concept explicitly in mind. It comes with a twist, focusing not on employee development, but on partner development in the value chain, with the goal of measurably improving customer satisfaction and sales growth. It’s mostly about supporting products: improving quality and system efficiency, growing sales and developing informed users who will fuel future demand and development. For-profit companies tend to care about these metrics a lot, so it’s easier to get their attention with solutions that help them with their measurables. And credentials already play a big part in this kind of learning. We’re just talking about making them digital and portable. We need to do a better job of getting into the private sector with Open Badge eCredentials and I suggest that we start where these bottom-liners care the most and move on from there. What is the Extended Enterprise? Wikipedia calls the Extended Enterprise “a loosely coupled, self-organizing network of firms that combine their economic output to provide products and services offerings to the market.” Wikipedia describes it as a multi-stakeholder view of Michael Porter’s value chain. Or maybe an ecosystem of ecosystems? Whatever, it’s an increasing reality as organizations in different sectors realize that they can’t do it all by themselves and that there’s power in organizational clusters. Slideshare: What Is An Enterprise? Instructure’s Canvas LMS, with its open architecture, GitHub code sharing, EduApp plug-in sharing and Canvas Network course sharing centre is a stellar example of an extended enterprise approach to LMSs. But a fit-for-purpose LMS can also be a key enabler for Extended Enterprise Learning. the delivery of training, certification programs and knowledge assets not only to employees but also to customers, partners, suppliers, channel and distributor networks, franchisers and franchisees, association members, independent agents, contractors and volunteers — in short, any stakeholder who does not work directly for the organization. Why is Extended Enterprise Learning Important? Because that’s where private sector organizations will spend money for training first. They’re business people before they’re employers and they often have trouble seeing a direct bottom line benefit to employee training. But they will pay for training that measurably shrinks their costs or grows their profits. Employee development is good, but it is hard to prove progress, so less innovation happens there and budgets are tighter. For the extended enterprise, it is all about building a community of voluntary learners, keeping them engaged, giving them paths to content and credentials they want and need. You want them to buy content, contribute content, and do it again and again…. John makes his living recommending fit-for-purpose LMSs for Extended Enterprise Learning needs. He also wrote a great article about developing an ROI framework for extended enterprise learning that will help EEL make the case and sustain the initiative. I actually think it could teach a few things to people seeking to justify employee training. I think Open Badges have exciting potential for supporting this kind of diverse learning, with its multiple contexts and roles and the often volatile, emergent nature of learning objectives. I’ve summarized my thoughts below. In extended enterprise training, the student isn’t necessary known or identified. NB: Open Badges are the perfect solution for this situation, since they don’t require that you register in a learning management system in order to learn and be recognized for it. You can create communities of interest and encourage participants to develop skills, share their success stories and help answer others’ questions. You can wrap contests and awards around your learning programs to engage and motivate participants. The possibilities are endless. Ideally, you can build a growing global community of customers who are committed to your brand and help others learn about it too. Innovative marketers are experimenting with the next evolution of content marketing – offering on-demand training. This strategy provides your prospects with demonstrated value from the time they spend with your company, even prior to entering a buying cycle. Increase your brand awareness by offering industry thought leadership content that is scalable, convenient, and interactive. You can even offer certifications and accredited professional development hours. NB: eCredentialing is great, but too many of the solutions offered rely on LMS silos, offering only the ability to post your credential on LinkedIn. There’s more to social media and learning ecosystems than the ability to post your LMS credential on LinkedIn. LMS siloes are all about the vendor and vendor lock-in. Open Badges can be elements of a standards-based, loosely coupled ecosystem where learning and recognition can travel easily across LMSs and other technology systems. Other private sector ICT sector companies who have jumped on the Open Badges bandwagon include Adobe, Oracle, Autodesk, Microsoft, Citrix, Linux Professional Institute (LPI), Juniper Networks, Cisco, Red Hat Linux, Hortonworks and Lenovo. It’s only natural that ICT be a key early adopter with its focus on technology, but technology has had an transformative impact on the entire World of Work and Open Badges can be a great fit for other sectors too. It’s interesting to see that Education is listed as the most active EET. I’m trying to wrap my head around that. If it’s product learning, what’s the product: the learning or the credential? How is the use of that product being supported by external learning? Who’s the customer? Who’s the upstream supplier? Downstream distributor? I can see some room for discussion of Professional and Continuing Education, adjunct faculty, online consortia, government and private sector relationships, but still… I see Education as more of a supplier to other EETs. On the other hand, Education is the most actively engaged with Open Badges, so that’s a strategy for them to better engage EETs with modular education and training supported by recognition pathways. Current example: the Manufacturing Institute has Project Lead the Way for youth talent pipelines and its M-List, a Skills Certification System which brokers college training aligned to industry quality standards, but I don’t know of any product training programs that are credentialed with Open badges. Watch this space. I’ll continue to dig. Not much yet; regulatory issues could be a barrier, but there is a lot of potential here. Another space to watch. Some glimmers – not much. This would makes sense for distributed financial products such as mutual funds that require a diverse multi-channel salesforce. There is the so-called Belgian Backpack, but not much else that I know of, other than some interesting early experimentation in Ottawa related to a government-wide change initiative called Blueprint 2020. This is an area of potential significant growth. What if GovLoop understood the power of Open Badges to recognize learning across sectors and jurisdictions? Lots of potential here and some early action. I’ll be looking at this sector in more depth in a future post. It’ll be interesting to see how all this plays out over the next 12-24 months. The best customer is an educated customer. To this I would add “and the best partner is an educated partner”, whether that be a supplier, distributor or another stakeholder whose success is linked to yours. I’ve focused on private sector extended enterprises in this post but as mentioned above, I’ll be looking the concept more closely in the public and not-for-profit sectors in the future. This post explores the potential for developing a micro-credentialing system based on Mozilla Open Badges (* see Footnote 1) for Professional Development in Aboriginal Education (** see Footnote 2) and increased awareness of Aboriginal Canada in the broader education system. To some extent, it builds on my earlier post: Why do K12 teachers like Open Badge eCredentials with their PD? But it also applies the principles of Global Education to a better understanding of Aboriginal Canada. The idea is to start with teacher PD but the ultimate goal is to take it to students. Only 40 per cent of First Nations students living on reserves graduate from high school. They score far below other students on standardized tests. And their numbers are about to explode. What are our children and youth experiencing in the classrooms…? And what is the experience doing to them? Have we come far enough from the bad old days of residential schools whose wounding impact the Truth and Reconciliation Commission was established to help heal? Can eCredentialing with Open Badges help bridge gaps in Aboriginal Education, starting with transforming the knowledge, attitudes and capabilities of teachers? It would be just one element among many others trying to help solve a huge issue, fraught with controversy and past failure. But I believe it could help and I’m beginning to see a willingness to try new ideas in the emerging policies of our new federal government. We believe that education has the power to change the world. And we see teachers as force multipliers with the potential to reach and affect huge numbers of young minds. So we start with teachers. And educators seem to really like having their PD recognized with micro-credentials. I’ve blogged previously about PD badging initiatives such as Digital Promise and PD Learning Network. I like the self-directed, evidence-based approach I often see in educator PD. It’s not just about rewarding attendance at conferences and workshops. Houston’s badging initiative is a partnership with VIF International Education, mentioned above who was one of the winners of the DML Trust Challenge with their proposal “Global Gateway: Building Trust Through Peer Review”. We support teachers in developing and applying global competence in their classrooms through focused and measurable professional training, flexible resources and peer-to-peer collaborations. Although I’ve been speculating about badges for Aboriginal education for some time, the trigger for this post was a Teacher PD panel at the HEQCO Transitions conference last week. The panel focused a lot on Aboriginal Education due to participation by John Hodson of Maamaawisiiwin Education Research Centre and Kyle Hill of Teach for Canada. Here in Canada, Aboriginal Education is getting lots more play recently, due to the December 2015 release of the Final Report of the Truth and Reconciliation Commission and its acceptance by Justin Trudeau, leader of the new federal government which in its historic 2016 budget allocated $2.6 billion of new funding over the next five years for primary and secondary schooling on reserves. One common thread is teacher capacity, particularly in terms of knowledge and attitude. This is very important for schools on reserves but also for the more than 80% of Aboriginal kids educated off-reserve (at least in Ontario) – and for the rest of our population to better understand Aboriginal Canada and our relationship to it. These ideas are exploratory and in no way exhaustive. They range from easy to more ambitious. They can be said to have formative, summative and transformative elements in different degrees. Some of these ideas attempt to transfer VIF’s approach to Global Education to a notion “Inter-Nation” education, between Aboriginal Canada and the rest of our population. Naturally, these ideas would need to be realistically evaluated in light of the needs and choices of Aboriginal stakeholders, political realities of federal-provincial relations and labour relations with teachers. This can be fairly straightforward, merely digital recognition of current practice, but care should be taken in introducing it, to test engagement and take up. Small-scale pilots and proofs of concept may be the way to start, so that assumptions can be tested and adjustments can be made early on. As with Digital Promise and PD Learning Network, teachers could engage with resources independently, reflecting forward on how their new learning may affect their practice and reflecting backward on its actual impact. They may also develop other evidence of their learning for evaluation when challenging for badges. This is still not much of a stretch, merely applying a well- tested PD approach to a new domain and different standards. But it should fit in with our PD practices up here. The final product of every module is a tested, global lesson plan that articulates learning objectives, activities, assessments, and resources for each stage of inquiry. Upon completion, teachers may publish finalized lessons in a resource library where they can be accessed by other educators. Imagine this global learning model applied to “inter-nation” learning for Aboriginal Canada. It would take a lot more effort to set up, but there is exciting potential here. How can we clearly articulate existing and emerging competencies and support and recognize the accomplishments of educators as they develop throughout their careers? How can we better connect educators with peers so they can share and more quickly adopt best practices? And, what are ways teachers can be supported while driving their own learning? As an emerging professional learning strategy for educators, micro-credentials show great promise. Other initiatives have shown that recognizing the learning of teachers is a great way to seed ideas for recognizing the learning of students. We also have the Manitoba example of Igniting the Power Within, which also started with professionals, in this case community advisors and counsellors. The project developed and tested curriculum and resources about workplace Essential Skills and RPL. Using a portfolio framework, this richly metaphorical authentically appreciative learning model has been used in Aboriginal communities to recognize and document the skills, knowledge and gifts we all have. It has made an impact on the lives of thousands of people. Teachers and other professionals who have earned micro-credentials can think of creative ways to transfer their own experience to their students and clients. In the spirit of appreciative inquiry, this kind of modular recognition can build learning pathways based on small positive steps, starting from where each person is at. This could be a Western teacher unaware of Aboriginal Perspectives or a student unaware of the Western scientific method. This illustration from a Manitoba curriculum document draws on work from Alaska to describe the similarities and differences between Aboriginal and Western Ways of Knowing. I see it as a map indicating how to bring communities together to find shared values through connected learning. I see Open Badges all over it. There is a disconnect in today’s traditional education system, which leaves many youth disengaged in school and unprepared for the workplace and community. Now more than ever, young people need access, inspiration and guidance. In Canada, when we say Aboriginal, it’s an inclusive term that means First Nations (mostly treaty-based, on reserve and off), Métis (mixed race, with a distinct culture, recently achieved official status) and Inuit (also incorrectly called Eskimo) populations. People in the US might just say “Native Americans”. This post continues an exploration of how Open Badges can support Personal Learning in Open Learning Networks. Open Educational Practices, if you will. I’ll be exploring those in future posts. Today’s post is part of a series that is inspired by #NRC01PL, Stephen Downes’ Personal Learning MOOC. It picks up on my post from last week, which, among other things, said that Open Badges are becoming machine-readable nodes in open networks. So I looked at the pieces in Stephen’s diagram and reflected that Open Badges are pretty modular too. They’re JSON-LD objects, composed of standard fields with links to other information objects and they’re intended to be combined in pathways, stacks and clusters, based on the information they represent. They can be people, content, metadata, and even badges to name a few. This is what I was trying to get at in my last post about the “Internet of Badge Things”. Learning doesn’t flow in just one direction. Open Educational Practices talk about knowledge ecosystems with feedback/remix loops. The notion that learners bring value to the equation is something that’s most familiar in adult learning and the college system, but it’s more or less true everywhere. So why can’t a badge earner’s evidence become a learning resource, whether they’re curating and remixing somebody else’s work or coming up with something new? I actually had a similar thought in the 1990’s while leading the Online Group at TVOntario. But I wasn’t able to do much with it, other than code name it Boswell and make a diagram I can no longer find. Maybe now? There’s been a lot of attention paid to the value that can be baked into a badge at issuing time, but that’s really just potential value (I’m talking the summative side here). It’s when a badge is shared and recognized that its “mint” value hits reality and becomes exchangeable currency. This will happen in social settings: online communities, badge clearinghouses, job and work portals, and also in peer to peer exchanges, via emails, blockchains, personal open ledgers and other methods we haven’t thought of yet. This isn’t just my thought… my colleague Serge Ravet has been saying it for ages. I’ll add a connectivist point here: it’s not just the resources and nodes that have value, but the way they’re connected through patterns of use – the network cluster. I think that the emerging Open Badges ecosystem is a similar distributed knowledge and learning architecture to the one Stephen describes in his presentation and can indeed supply a lot of the virtual routers and cabling for Stephen’s vision. Issuers can be earners, earners can be issuers, and anybody can be an endorser of a kind. Agents, objects and connections can exist at many levels. This has the makings of an emergent knowledge and innovation ecosystem – the network as a learning thing. There is value in the badge itself and in its relationship to its environment. It’s potentially much more than a top-down credentialing protocol for training and education, though it can certainly do that. These last few blog posts that are connected to topics in #NRC01PL have been difficult for me to write, but I think it’s because I’m rewiring my thinking as I write, making my way through a few conceptual thresholds. This rewiring promises to make my future badge system planning more robust and flexible. Personal portfolios that are robust learner-owned resource profiles, identifying you as qualified for a particular role. I’ll be coming back soon to focus on current examples out there and more immediately practical concerns for Open Badges in early 2016… blame #NRC01PL in the meantime. I’m looking forward to participating and speaking at the Digital Badge Summit in June, with badge community luminaries such as Nate Otto, Doug Belshaw, Serge Ravet, Dan Hickey, James Willis and Eric Rousselle… that’s just naming a few! There’ll be something for everybody: K12, Higher Ed, PD… Nate Otto and I will be curating a “Hot Topics” thread. 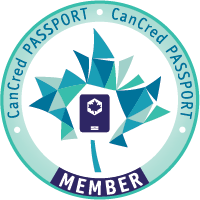 I’ll also be sticking around with Eric Rousselle and his colleague Nilü for the ISTE conference afterward to help introduce Open Badge Factory to the US K12 community, along with an exciting new offering for the Canadian K12 community. More on that later. This post is a change of pace for Littoraly. It begins to question the notion of Open Badges as scalable micro-credentials. How modular are they? Are they like lego blocks or are they fractal and chaotic? How far can we push the notion of modularity? It’s part environmental scan and part thought experiment. I had wanted to explore this anyway, and the fact that #NRC01PL, Stephen Downes’ Personal Learning MOOC is now actively developing the notions of connectivism, emergence and recognition gives me a perfect opportunity. The point of the post is the Draft Ecosystem Scaling Chart towards the bottom, but it takes me a while to set it up. You may want to cut to the chase and then loop back. But the video alone is worth the price of admission. Today’s post begins to explore the boundaries of the third reason. It goes from nano through micro to giga. But Stephen argues that learning is not as neatly compartmentalized and nestable as many may think. Connectivism is based on the notion of neural networks. Learning happens via “neuro-plasticity”, where connections are made and reinforced with activities. The value is in the patterns of active connections. It looks like chaos, but in fact it’s just the complex result of simple interactions at different levels.Each level has some degree of both independence and interdependence with peer, sub- and super-nodes and networks. In moving from version 1 to version 1.1, Open Badges moved from JSON to JSON-LD. LD stands for Linked Data, which enables structured searches, not just crawling unstructured text. JSON-LD enables new descriptive properties to be added to Open Badges that can be mapped to external vocabularies and frameworks. Geo-location is one example that has been implemented, various competency frameworks should come soon, third-party endorsement is in the works for v2.0, scheduled to come out later this year. In the meantime, according to a recent community call, the Open Badge Network project in Europe is working on an Open Badge extension for competency alignment using InLOC linked data, a JSON-LD framework designed by Jisc to support the sharing of learning information. And if work with the W3C’s Verifiable Claims Working Group continues to go well, Open Badges will become “payment grade” verifiable claims, linked to owner identities rather than the online service that issued them. So, imagine if there were millions of Open Badges (there already are) whose various properties were discoverable by both humans and machines, whose aggregation and deconstruction could scale through algorithmic protocols, supplemented by other locally relevant, possibly unstructured information as necessary. Although initiatives such as Connecting Credentials and IMS Global’s Open Badge Extensions for Education (OBEE) are trying to find common ground for exchanging information about skills and learning, people are people and context is context. What’s “grit” for one community is “resilience” for another; what’s level 6 in one framework is level 4 in another; what’s relevant evidence in one context is perceived as opaque or infantile in another. Bits and pieces from different systems are borrowed, mashed up and transformed into new things. I confess that I need to go through this philosophical stuff a few times more in order to really get what he’s on about. Basically, I take it to mean that things aren’t as simple and modular as many might suppose. A diversity of methods for learning via emergence and recognition will be required, which would include structured and non-structured information. But I like the word recognition. That’s probably because I like the phrase Recognition of Learning…and not just prior learning, but also emergent learning. Imagine you’re a global services company with half a million employees around the world, scattered over countries, regions, occupations and lines of business. How can you possibly foster learning and innovation across your operation? One global services company I know is considering Open Badges. The example I was given was to imagine a small shop in Kuala Lumpur coming up with an innovation, whether it be a cool new method or piece of technology. One way for them to spread the innovations is to offer a badge offering to teach it. This advertises the innovation, provides a method for disseminating it along with a way to track its spread, as earners display their badge instances. This is a rough first attempt to track the potential scalability of Open Badges against Stephen’s levels of MOOCs and education in general. I’m not totally happy with how I’ve matched levels, and I’m already thinking I may need to separate issuer/earner/consumer functions in future versions. But I hope readers will recognize enough here to to come up with a few emergent ideas of their own. NB: Stephen starts at 2000, goes up to the planetary level, then back down to the sub-microscopic level. I’ve chosen to simplify by starting small and going big. I don’t think I’ve nailed this yet; this is me thinking or learning out loud. I’m still pondering how connectivism affects the notion of badge scalability. For one thing, I’m still struggling with constructivist modularity vs. connectivist emergence and recognition. As an example, trades have skill sets that are in National Occupational Analyses (NOAs) such as this NOA for Cooks. It’s pretty analytical, but wouldn’t you want to feel confident that you had covered the bases? But maybe it doesn’t cover all the bases, because it’s not holistic enough. Is there a better way of doing this? I do know that my chef friend says that a good test of a cook is how well he/she slices a tomato – that combines several pieces of skill and knowledge into one seemingly simple capability. I think I would fail, but I blame my tools – oops, sharpening knives is one of the skills. Open Badges do a useful job of filling gaps in our current education and training systems. And I think they can provide useful data points in holistic recognition recognition systems, which is a point I made in my last post. But all in all, I’m feeling pleased about having joined this mini-MOOC, if only as a way to test my evolving ideas about how Open Badges can recognize learning. These profit units compete with each other and the private sector in providing learning opportunities primarily to adults tweaking their careers and professionals maintaining their currency. These trainers want to increase the transferable value of their custom programs by aligning them to skills frameworks, development pathways and certifications. Often part of the ConEd function in colleges and universities, contract trainers can also be private sector organizations, from large consulting firms down to independent trainers. These small to medium-sized operators compete with the above and are often seeking more profile and brand footprint, along with better ways to communicate the quality, impact and transferability of their programs. Unlike their institutional competitors, they often don’t have the the advantage of formal accreditation. They want to boost their “gravitas”. Product training increases customer retention and is often another revenue stream for private sector companies. There’s lots of early traction in the ICT hardware and software sectors, but other types of products also have great potential: vehicles, pharmaceuticals, food processing, etc. Early evidence suggests that product training and its impact on revenue will be the “sharp end” of Open Badges adoption in the private sector, rather than workforce development, with some notable exceptions, such as the Scottish Social Services Council. All of these groups can benefit from early adoption of eCredentials powered by Mozilla Open Badges. Granted, what I’m talking about here is not the core of the original Mozilla dream of Open Badges. But it is a leading edge for technology adoption that will help pull the whole into the mainstream. Once enough practical people see enough business benefit in Open Badges to pay for them and make them part of their business, then you start to have a diversity of sustainable business models that will help build the skills ecosystem that Mozilla did dream about, and help pull the more idealistic elements of the dream into the ecosystem, and build demand for all kinds of credentials. This can happen without corrupting the original idea of an open skills ecosystem. People *can* make money providing products and services in open systems. That’s called the network effect. That’s called the Internet. That’s why Mark Surman of Mozilla compares Open Badges today to the early days of email. If we can manage even a part of that, we’ll be doing it long after the foundation funding dries up. I’ll be talking more about the advantages and nuances of staying “open” in future posts. But there are also health and safety compliance examples out there such as annual WHMIS and HAACP certification, and I’m even starting to hear about training programs that credential pharmaceutical logistics skills, because of the bottom line importance of safe and efficient transportation of perishable pharmaceuticals through the supply chain. How do you eat an elephant? One bite a a time. If you can break a longer certificate program down into bite-sized chunks, you may get more busy adults completing the program, even if they do have to drop it for a while and pick it up later. This last one is interesting. Roy Group was convinced to get into Open Badges by Sir John Daniel, formerly head of the Commonwealth of Learning, also based in BC. When they did, Sir John wrote Roy Group a letter of commendation for “demonstrating its own leadership by using Open Badges to recognize formally the skills and experience that its clients acquire.” They proudly display this letter on their website. So, with all these benefits, why aren’t more trainers using eCredentials to build their businesses? Awareness is still an issue, but that’s starting to change. Certainly, if you don’t know about it, then you can’t do anything about it. Once you do know about it and can see the benefit, you may click with it right away if you’re an early majority type. If we start handing out “badges” like stickers for kids or schwag at conferences it could make us look childish or trivial. Or we could screw it up other ways. This could damage our reputation as a quality institution. It’s true, Open Badges are easy to do… badly. This can result from any combination of issues around vision, ignorance, hubris, governance, lack of planning, etc. See Six Steps to Building High-Quality Open Digital Badges from the folks at the Center for Research on Learning and Technology, Indiana University for some hints on how to do it better. It’s also one of the ways I make a living while I try to make a difference: helping organizations build better badge systems. Our ability to credential learning is our key differentiator. Why would we want to cheapen that into a commodity? OK, but we’re talking ConEd and work-related training here. A credential need not be a certification or a diploma in order to advance the learner’s career. Practical utility trumps rigour; private sector trainers already know this. It’s what they liked to call “fit for purpose” in the UK, before the term became over-exposed. We have digital badges in our courses; are they Open Badges? What’s the difference between a micro-credential and a nano-degree? How many credit hours in a badge? We need to figure this stuff out. Rather than try to figure all this stuff out in advance, my advice is to pilot in low risk environments using whatever technology is available. Set up a low profile sandbox, immerse yourself exploring concepts and use cases, “fail early”, figure it out iteratively with your colleagues and trusted stakeholders and then go on from there. Many institutions are now at this exploratory stage. If you try to work it all out in advance before you take your institution forward, you may end up looking like a conclave arguing about the number of angels on the head of a pin inside your castle while barbarian hordes and rival city states are hawking their wares outside your gates. Excerpts from LinkedIn’s announcement video (https://youtu.be/W9jZPAomVvg ) make it clear that they want to manage profiles for every job, higher ed institution, company, and person in the global workforce. LinkedIn will then allow students to search for desirable jobs and employers, assess the skills required for any given position, and the best places to obtain those skills – including through LinkedIn’s online courses via Lynda.com. Hmm…is this an opportunity or a burning platform? 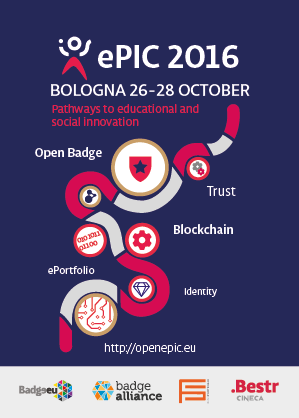 NB: Join us to explore these ideas and more this fall in Bologna at ePIC 2016! Mairi Anne Macdonald of the Scottish Social Services Council is just one example of a stellar list of keynotes we’re assembling. She’ll talk about how they’re badging a 192,000 strong sectoral workforce with a focuson informal learning. Get your ePIC proposal in now!